There have been several attacks on various SSL/TLS configurations the last few years so configuring SSL/TLS correctly is a slippery slope. To keep up to date on the current state of affairs I strongly recommend you keep an eye on SSL Labs and follow @ivanristic on Twitter. 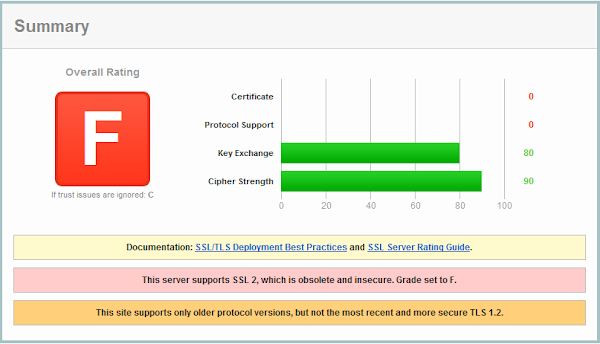 SSL Labs provides a SSL server test that quickly assesses your servers’ current configuration and you’ll find a series of blog posts by Ivan Ristic that go into detail on the various SSL/TLS issues. It refers to a blog post discussing insecure TLS configuration for a governmental site. The configuration was later hardened to the point where the site became incompatible with most browsers (click “Updates” at the top of the blog post). TLS configuration is a slippery slope indeed! I did an SSL Labs scan of the governmental site, and it reported "HTTP server signature: Microsoft-IIS/7.5" so it was almost certainly running on WS 2008 R2 servers with default TLS configuration (we’ll get to those in a bit). The incident is a brilliant example because it shows two out of three outcomes based on how you configure TLS. First, you might be called out for running with an insecure configuration and not protecting your users. Second, you can't enable only the latest and most secure protocol versions, as you would break your site for a large number of users. TLS configuration is all about finding the right balance — the third and preferred outcome. WS 2003 had SSL 2.0/3.0 and TLS 1.0 enabled by default. The default installation did not support AES ciphers – but support could be added through a hotfix. WS 2008 also had SSL 2.0/3.0 and TLS 1.0 enabled by default, but improved the cryptographic support with new AES cipher suites. WS 2008 R2 introduced TLS 1.1 and TLS 1.2, but they were disabled by default. WS 2012 takes us a step further with TLS 1.2 enabled by default. As the list shows, supported versions are one thing, enabled versions are another. To complicate things further there’s a set of supported cipher suites for each protocol version, i.e. combinations of key exchange, encryption and hash algorithms used to secure the channel. We need to enable both secure protocol versions and secure cipher suites to secure the connections to our servers. If you’re running a web server, IIS relies on the Secure Channel (Schannel) security support provider included in the Windows OS to handle SSL/TLS connections. You’ll find the default cipher suites and their preferred order documented in Cipher Suites in Schannel. Schannel is configurable through a number of registry settings. Recommend replacing 1024-bit certificates straight away. 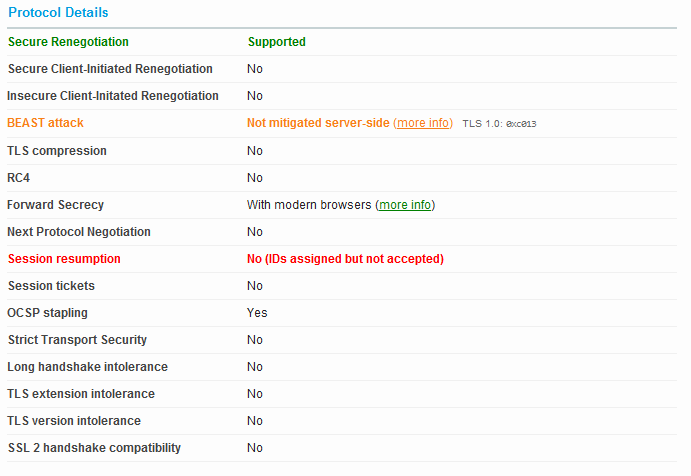 Recommend against supporting SSL v3. Remove the recommendation to use RC4 to mitigate the BEAST attack server-side. 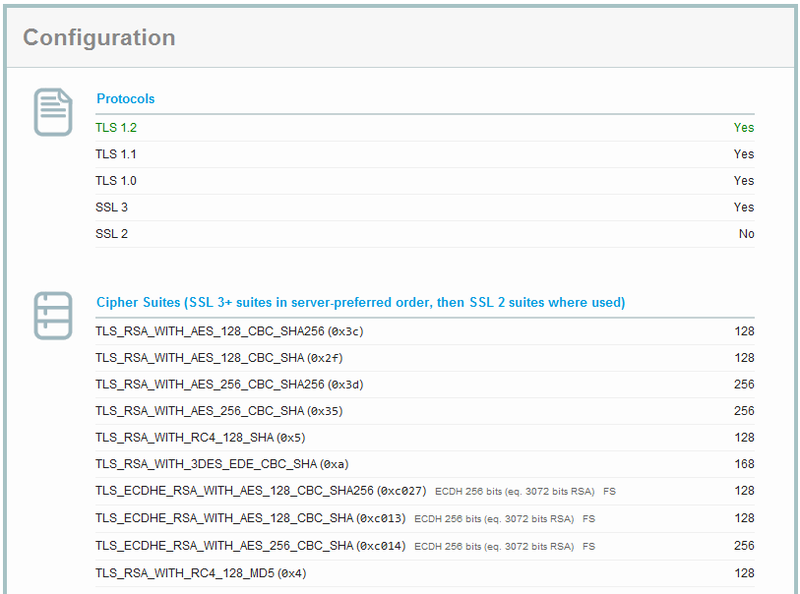 Recommend that RC4 is disabled. Recommend that 3DES is disabled in the near future. Warn about the CRIME attack variations (TIME and BREACH). Add discussion of ECDSA certificates. We’ll briefly discuss each recommendation before we look into default Windows Server TLS configurations. The new recommendation is to use certificates with 2048-bit RSA keys. Google announced in May that they were switching to 2048 bit keys in their certificates, and are now using new certificates on e.g. google.com. There are also upcoming changes to Google Chrome's certificate handling. In early 2014 we can expect Chrome to start warning users about certificates that fit certain criteria: if they have a key length < 2048 and are valid from or after 1. July 2012 or expire after 31. December 2013. The Microsoft Security Development Lifecycle (SDL) Process Guidance - Version 5.2 requires that you use 2048-bit or better RSA keys, and it’s also a requirement for SSL certificates in Windows Azure. Consequently, this recommendation is in practice already a requirement, so make sure you generate new 2048 bit keys when ordering new certificates or renewing old ones. Clients that only support SSL 3 are (finally) dying off, so disabling this version will only break the internet for the tiny fraction of users that still run ancient software such as IE 6 on Windows XP. Google announced three years ago that they would start phasing out support for IE 6, and many other sites have followed. Note that Microsoft still supports Windows XP (until April 8, 2014), but a patched Windows XP will be running IE 8 and support TLS 1.0. Consequently, it should be safe to disable SSL 3. The RC4 cipher is now considered insecure, and it is recommended to drop support for it. The recommendation might well become a formal requirement in the future. A recent Internet-Draft, Prohibiting RC4 cipher suites, requires that TLS clients and servers drop support for RC4 cipher suites. RC4 was the recommended mitigation to the BEAST attack, but recent browsers have implemented client-side mitigations for this attack (except Safari). Weighing one risk against the other, it makes sense to disable RC4 since it affects all clients. To learn more about the RC4 vs BEAST tradeoff, see Is BEAST still a threat? The recommendation to disable 3DES is a bit more problematic. Windows XP does not support the AES cipher suites added for TLS 1.0, and when we’ve sifted out the insecure cipher suites (including RC4) supported by XP we’re left with 3DES as our only option. Disabling 3DES means we’d break our site for XP/IE8 users — that could be devastating considering XP still holds a 20% market share. So unfortunately, we’ll have have to stick with 3DES for now. The CRIME attack showed how a middleperson attack could extract information from the encrypted traffic to sites that had TLS compression enabled. Schannel does not support TLS compression, so CRIME is not a threat for applications running under IIS. Earlier this year two related attacks emerged, TIME and BREACH, both targeting compressed HTTP responses. It is unclear how we can mitigate these attacks in a practical manner, but you’ll find a discussion on how e.g. CSRF tokens can be protected in Defending against the BREACH Attack. We can’t mitigate the attack through TLS configuration (which is the topic of this post), so we’ll move on to the next recommendation. Forward secrecy refers to how session keys are set up for a TLS session. In the TLS cipher suites that are typically used (such as TLS_RSA_*), session keys are protected under the RSA key found in the server’s certificate. If someone records the encrypted traffic to the server and at some later point gets access to the server’s key, all recorded sessions can be decrypted. Cipher suites that offer forward secrecy improves the situation by employing temporary keys during the TLS key exchange. These keys are thrown away after the session keys have been generated. This protects each session under separate, temporary session keys. An adversary would have to crack the session keys to learn the contents of a recorded session — and would have to repeat the process for each session. The cipher suites that offer forward secrecy are the ones named TLS_DHE_*and TLS_ECDHE_*. We won’t go in to further details here, but you’ll find a nice explanation in Deploying Forward Secrecy. Google started rolling out forward secrecy two years ago, and other big players are following their lead. We should all follow their example to better protect our users. The final SSL Labs recommendation is to use ECDSA certificates. These certificates contain an ECDSA public key instead of an RSA key. ECDSA keys rely on a different type of math based on elliptic curves (EC), yielding a better keylength/security ratio than RSA. This means we can use smaller keys, but still achieve the same level of security. Unfortunately, ECDSA certificates aren’t quite mainstream yet. I’ve tried to find a CA that would issue ECDSA certificates, but no luck there (yet). When these certificates become more generally available, we should seize the opportunity when current certificates expire and make the switch. Note that if you’re running your own CA you could set it up to issue ECDSA certificates. That was a brief overview of the new SSL Labs recommendations, next we’ll look at the default configuration for recent Windows Server versions and see how they fare against the recommendations. To give a snapshot of what Windows Server offers out-of-the-box in terms of SSL/TLS, I’ve collected some data based on the Virtual Machines (VMs) and web role instances that are available through Windows Azure today. If you spin up a new VM on Windows Azure you can choose between WS 2008 R2 SP1 and WS 2012 Datacenter (or a bunch of Linux distros which is really cool). For web roles you can choose between Guest OS family 1-3. Microsoft is retiring support for version 1 (WS 2008) so we’ll look at version 2 (WS 2008 R2) and version 3 (WS 2012). Guest OS family 2 is the default for new cloud service projects in Visual Studio 2012 with the latest Azure SDK. You can manually change the OS family version to 3 in the ServiceConfiguration file in your cloud project to get the latest version. The WS 2008 VM flunks the SSL Labs test. The server scores 0 on “Protocol support” since it supports SSL 2.0, and there’s also a note that SSL 2 support will give you the grade F. Due to laziness I set the server up with a self signed certificate which also gives it a zero score on the certificate. We also note that SSL 3 is enabled, and that TLS 1.1/1.2 are disabled in the next figure. 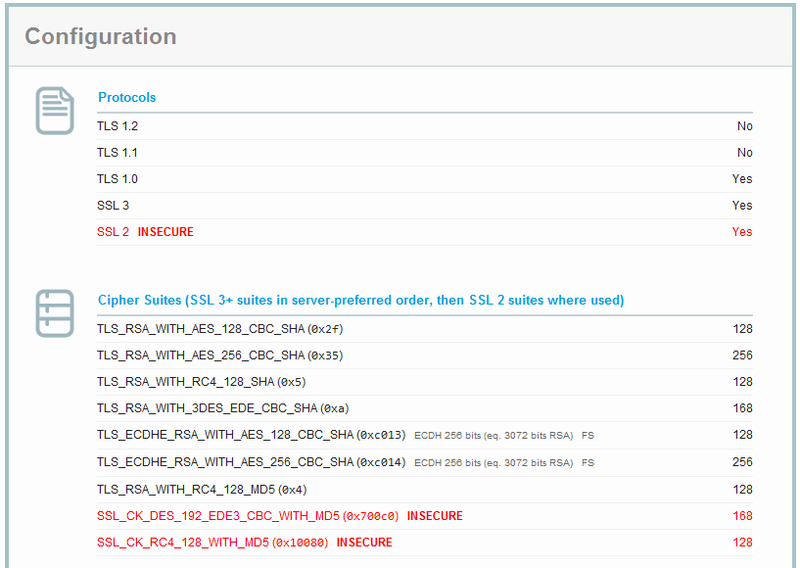 SSL Labs warns about two insecure SSL 2.0 cipher suites and we see that RC4 is enabled. There are two cipher suites offering forward secrecy (TLS_ECDHE_*), but they’re placed towards the end of the list. This means that they won’t be selected in practice since browsers support at least one of the suites with higher priority, i.e. unless you disable them by hand in your browser configuration. The picture could have been much prettier as WS 2008 R2 supports TLS 1.1/1.2, but unfortunately these versions are disabled by default. The decision to enable SSL 2 by default is questionable to say the least. SSL 2 was released in 1995 but a number of security flaws led to a redesign and the release of SSL 3 in 1996. If you’re running WS 2008 servers you don’t have much of a choice — you have to harden the TLS configuration! I assume this was the problem for the governmental website mentioned earlier. Next we’ll have a look at the WS 2008 R2 based web roles, this time I’ve also installed a trusted certificate. SSL 2.0 is disabled for OS family 2 instances and this does wonders for the score. We still get a warning that TLS 1.2 is unsupported. 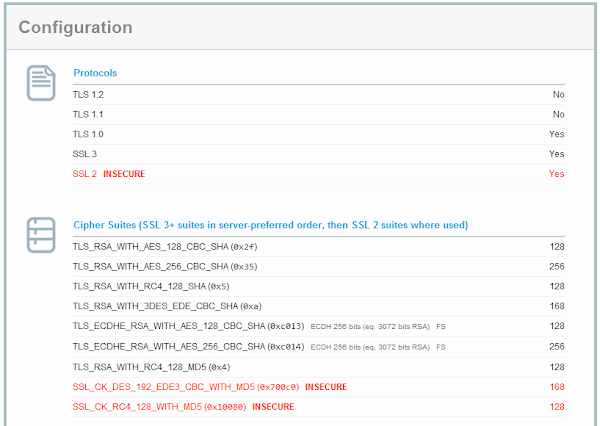 The SSL 2 ciphers are now gone, apart from that we see that the list is identical to that of the WS 2008 R2 VM. 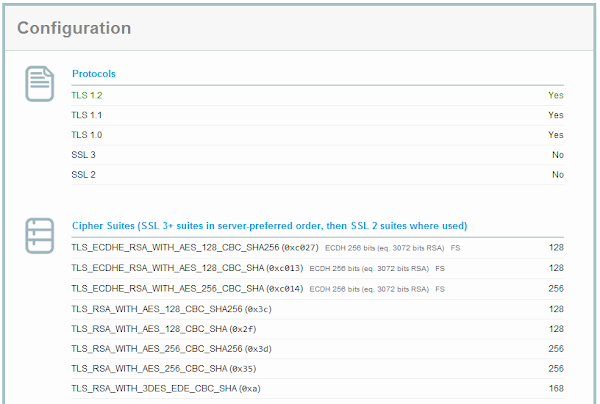 Even though this configuration is an improvement over the default WS 2008 configuration, it still needs tweaking to meet the SSL Labs recommendations. The TLS configuration is identical for WS 2012 VM’s and OS family 3 Azure instances, so we’ll just refer to them as WS 2012. 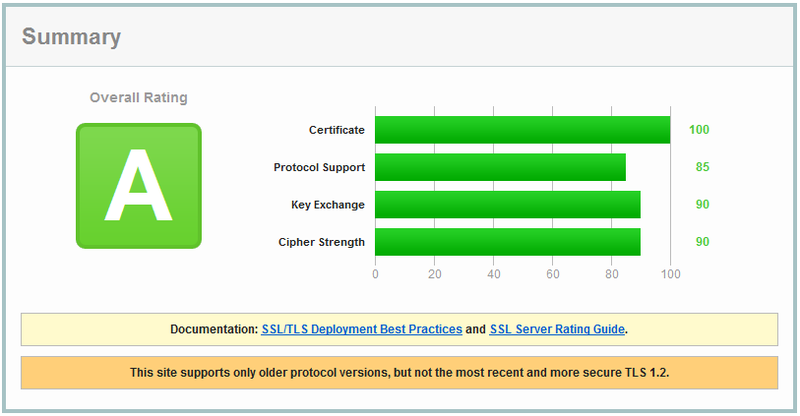 The default configuration gives us a better score on protocol support since WS 2012 supports TLS 1.2 out-of-the-box. In addition to TLS 1.2 support, we also get three new SHA256 cipher suites. Things are starting to look better, but forward secrecy ciphers suites still aren’t prioritized and SSL 3 is still enabled along with the RC4 cipher. For the WS 2012 there’s also room for improvement. Now that we’ve covered the current state of affairs, let’s turn our attention to how we can harden the TLS configuration. You might recall that you can configure enabled protocol versions and cipher suites in Schannel through a number of registry settings. The preferred order and support for cipher suites is configurable through group policy (and native code). Tweaking the registry can be cumbersome so you’ll find various clients that can help you manage Schannel configuration. Unfortunately, configuring TLS by hand doesn’t work very well for Azure applications. You’ll need to do it in an automated fashion since Azure instances can be re-provisioned at any time. That brings us to my announcement! The very first version of NWebsec.AzureStartupTasks includes an Azure startup task that configures Schannel according to the recommendations from SSL Labs. The scripts are available through a NuGet package for easy installation in an ASP.NET project. You’ll need to copy a few lines of config from the included ReadMe file to the ServiceDefinition.csdef in your cloud service project and you’ll be all set! You can download the scripts from the project website and add them to a project by hand if you don’t have the option of using NuGet packages. The scripts also work stand-alone if you want to run them by hand on a Windows Server. Refer to the Install.txt for instructions. Still all green, but we’ve turned the score on protocol support up a notch. Under “Cipher suites”, the forward secrecy suites are now preferred. Things are looking a whole lot better! Since we’ve brought the protocol versions and supported cipher suites in line with the current SSL Labs recommendations, we’ll look at the some of the “Protocol Details” in the test result. Things are mostly looking good, but there’s a warning about the BEAST attack. Unfortunately, at this point we can’t win. One countermeasure to thwart BEAST is to prioritize the now-considered-insecure RC4 cipher. Another option is to disable TLS 1.0 — which would break the site in most browsers. We’ll simply have to live with the risk for now and hope that Apple implements the client side BEAST countermeasure found in other browsers (and that all browsers move fast to implement TLS 1.2). There’s also a warning about session resumption. This is due to the Azure load balancer and non-sticky sessions. 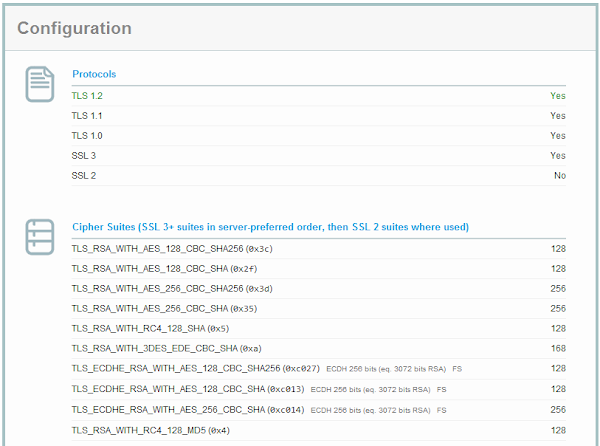 If you run a single instance in your cloud service, session resumption will turn green since all connections will hit the same instance. Session tickets, aka RFC 5077 (TLS Session Resumption without Server-Side State), are underway in Windows Server 2012 R2 Preview and can solve the problem with non-sticky sessions. As a side note, key management for session tickets must be implemented with great care to avoid breaking forward secrecy. For more details, refer to How to botch TLS forward secrecy. Fortunately, it’s Microsoft’s problem to get this right. OCSP stapling has been enabled by default since WS 2008. It improves performance and users' privacy. Strict Transport Security is a HTTP security header that instructs web browsers to use HTTPS only when communicating with your web site. You’ll find more details in my blog post on Security through HTTP response headers. The header must be set in your web application, the NWebsec security library helps you set this and several other important security headers. The default TLS configuration in recent Windows Server versions needs hardening to meet recent recommendations. You can easily test your site at SSL Labs to see how it fares — note that anyone can do this for your site (recall the governmental website) so you’d better harden that configuration! The NWebsec.AzureStartupTasks NuGet package provides scripts that help you bring the TLS configuration in order for Azure applications. The scripts are available for download so you can use them on other servers, and you can easily tweak them to your needs. The NWebsec demo site will always be using the latest version of the package, feel free to put it to the SSL Labs test (select the www.nwebsec.com entry). Follow @NWebsec on Twitter to keep up with new releases. We’ve been focusing on TLS server side, but if you’re curious about how your browser is configured you should also check out the SSL Client Test. It takes two to tango, both the browser and server needs to support secure protocol versions and cipher suites. If your event log fills up with these, you’ve probably been SSL Lab’ed! Thanks in advance. Really helpful. any change you will update with windows 2012 R2 details? and what do you recommend we do with MD5 hash? I see your SSL Certificate on https://www.nwebsec.com/ is expired. Any chance of an update especially after the new ciphers recently implemented by MS in one of the more recent windows updates. In ssl labs test from where it will fetch the information about the protocols , it is from regestry editor of web server or else from where? Great article and better job, thank you. And here you can read about hardening servers using Android. Hire the best Assignment Writers of Students Assignment Help at the low-priced for assignment help Ireland services. Our broad-spectrum teams of writers are available anytime to assist students with the best quality assignment writing services. Did you know the number of courses offered in the Universities here? The number is over 30,000. Is not it amazing? From science to business, everything and every subject assignment writing Help and Essay Writing Services is taught here. Thanks for useful and informative post. Feeling stressed with doing your chemistry assignment? Are assignment deadlines knocking at your door? Let MyAssignmenthelp.com help you to get rid of all the troubles. We offer chemistry assignment help in U.S. which is a specialized, multifaceted online support service to students. We give the service of writing any chemistry assignment helpat all academic levels. Therefore, they have come up with valuable psychology assignment help in U.S. that not only helps them comprehend the complex concepts of Psychology, but also provide them with essential academic assistance that boosts their grades by leaps and bounds. Thanks for sharing post on Hardening Windows Server 2008/2012 and Azure SSL/TLS configuration. From a long time I am looking for this kind of informative post which help me as well as our clients to enhance there knowledge. I am lauren Ann, academic writer at leading assignment help provider company My Assignment Help Oz. Get help from the best report writing help writers by hiring Ireland assignment assistance. We have a professional writer who provides the best ireland assignment to our clients and students. Our writers have completed their higher education from the best ireland universities with excellent academic grades. Get the make my assignment services by the expert writers at Students Assignment Help. Our experts are proficient in writing assignments without missing the deadlines as they have gained their degrees from the top universities around the world. To write your college assignments you can hire expert do my assignments services from SingaporeAssignmentHelp.com, These assignment writers have completed there education from singapore university and having knowledge of writing any kind of assignment. Take dissertation writing service ireland services from the top writers of IrelandAssignmentHelp.com and stay relaxed of completing this challenging task yourself. We have well-experienced and knowledgeable writers in our team. My name is Sarah Smith and This is a very nice blog. Thanks for sharing with us. Keep it up and I can say that this an amazing and informative blog. , students can get in touch with qualified tutors of abc assignment help and receive immediate help on time. Singapore Assignment Help delivers assistance to students by its professional writers who serve report writing help services. Our assignment expert writers have earned their degrees from top universities and are available online to assist students. Are you worried for your coursework and have limited time to do? Het the advantage of Best coursework writing service with Academic writing experts. Such a nice blog post on this topic. It’s been a few years that Adam Hebdrew has been providing Essay writing help to all students in UK. Her flair for writing and in-depth knowledge make her an adept essay writer. Students, need her assistance, should call her through MyAssignmenthelp.co.uk. from certified PhD writers. It is extremely helpful for me. While Browsing the internet some website have the compatibility issue with TLS certificate. Some time it become hard to fix the issue, so we have to search for SSL installation services to get the fix. Certainly beneficial in student’s MBA assignment help and is actually contributing in their learning capabilities so that it brings clear aspects for students to grasp the major ideas and innovative concepts. so Great work! Here i can see the bundle of knowledge. that is really much informative for me. thanks to share. This blog is really much informative for the window. that is really much. This is really great things. Great Post, Thank you for sharing such a good and useful information here. I also have some information relevant for online dissertation help and Nursing assignment help in Australia. Very nice article, quite impressive. Waiting for more such posts. Get assignment help Sydney such as law assignment, assembly language assignment help, astronomy assignment help or auditing assignment help from GoAssignmentHelp. Get in touch now! this blog is really nice i really like it..
Top Homework Help is home to more than 3000 online live college homework help tutors who are quite impressive in solving various primary homework related issues. In fact, some of these tutors hold a PhD degree, which clearly shows how competent they are at handling various school and college homework problems. Nice blog post. The info provided is quite informative. The blog post is good. The article explores Hardening Windows Server 2008/2012 and Azure SSL/TLS configuration. It says that SSL Labs gives an SSL server test that swiftly appraises your servers’ present configuration and you’ll come across a series of blog posts by Ivan Ristic that go into detail on the different SSL/TLS issues.